THANK YOU for all your support with helping me get to where I am today. I am so grateful and blessed to have such a support group in reaching my goals. Accuhorsemat blanket increases body temperature and blood flow, which increases oxygen to the muscles and can lead to better performance. Sharon Trading Post has been a family owned business since 1987. Located right off exit 2 on I-89 in Vermont, the Sharon Trading Post is a country store that's full of great gifts and Vermont products. Thank you for all your continuous support with reaching my goals. 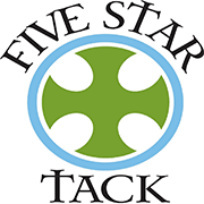 Five Star Tack - Designers and manufacturers of the finest quality bridles and strap goods for the high performance horse. Hand crafted from the best available materials and fittings without the high markup of similar quality bridles. Thank you Jamie Lenahan Greene for your continuous support and always allowing me to present my horses in beautiful bridles and breastplates!